Spin The Wheel is a live game show on Facebook that I play with all of my followers who have liked my @GiveawayJoe page. I choose random people who have entered and are watching my live show to have a chance at winning awesome prizes! How do I play Spin The Wheel? First, you must like the @GiveawayJoe page on Facebook. Once I go live on Facebook, I will post instructions on the video feed and I will also verbally give instructions on how to enter for your chance to spin the wheel. Keep in mind that simply just loading the video does not get you an entry to spin the wheel. You must also go to https://giveawayjoe.com/spin when the Facebook video is live, scroll down to the bottom of the page, and click “Enter” on the widget. This will get you an entry to the current spin. You will need to do this for each and every spin. 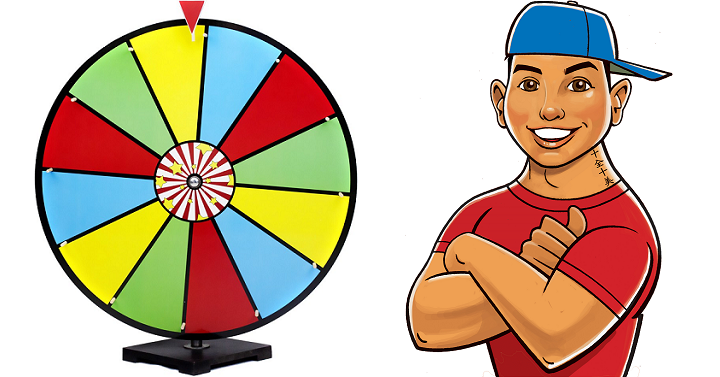 I typically spin the wheel a total of 5 times, so I will draw 5 different winners. However, there can be days where I randomly select more or less winners. At what time does Spin The Wheel start? Usually I start Spin The Wheel at 7pm PST, but I may go live at any time, so make sure you keep following the @GiveawayJoe page on Facebook and check back often to make sure you never miss out! You can also text the word WHEEL to phone number 48421 to receive a text alert when I spin the wheel. How are the winners chosen to spin? I use a popular widget called “Gleam” to draw the winners. Each winner is chosen randomly. If I’ve already won in the past, can I still play again? Yes! I’ve even had people win multiple times in the same live show. The winners are chosen randomly, therefore anybody can win at any time. Is this real? Do people really win? This is 100% real and people really do win! In fact, I kindly ask that all winners please take photos with their prizes and post them on my Facebook wall. You can see some of the photos by heading over to my winners page. If I win, how do I claim my prize? If you’ve won a prize on Spin The Wheel, you must send me a message on Facebook and I will send you instructions on how to claim your prize. Keep in mind that I do get a lot of messages so it could take up to 24 hours to get back to you. Last but not least, this is meant to be a fun show! I ask that everybody be nice to each other and congratulate one another, even if you don’t win. I can only give a certain amount of prizes away per day, but the more I grow, the more I can give away! Please make sure that you are spreading the word about my website and inviting all of your friends to like my Facebook page so everybody has a chance to win!